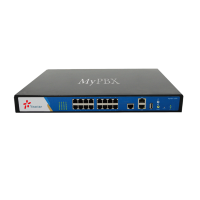 MyPBX is a classic Asterisk deployment on dedicated hardware. It supports ISDN and SIP trunks, plus a range of third party handsets. Configuration is done using the HTTP interface. Recent firmware is required (70.19.33.424 or later) to give full call control. Also "call waiting" should be disabled on the handsets to allow consultation to be used.